I don't mind to cook. Actually, I like it most of the time, especially when I have my menu already planned & my kitchen is not a mess. When I read that cooking a special treat for my hubby was one of the daily projects, I honestly didn't see anything extraordinary about it. I do a lot of the cooking anyway & Justin usually likes what I make. What made this really special though was knowing that this was just for him! He just made the comment last week that I hadn't made broccoli soup in awhile. Ding Ding Ding. I didn't have to put much thought into what I was fixing! 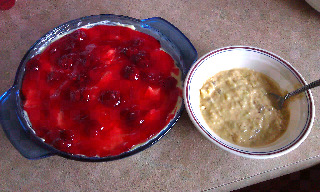 I also decided to make him a cherry cheesecake because that is his favorite dessert.